Brown seaweed weight loss supplement (Black goemon). High polyphenol, mineral, and oligo element content. Designed to reduce energy (or calorie) intake in overweight people . Could regulate glycemic and lipid responses. 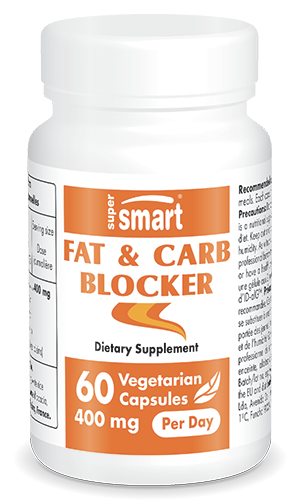 Fat & Carb Blocker is a slimming supplement formulated to reduce energy, or calorie, intake in overweight individuals. Its active substance is ID-alG™, an extract of Ascophyllum nodosum or Knotted Wrack, a common brown seaweed native to North Atlantic coasts. Ascophyllum nodosum is rich in polyphenols, minerals and trace elements, giving it particular slimming properties. This algae extract also contains iodine, a trace element known for its essential role in energy metabolism, thermogenesis and reducing fat mass. Although the extract’s mechanism of action is not yet completely understood, one explanation suggests it modulates glycaemic and lipid responses. Its marine polyphenols are believed to inhibit two of the body’s principal digestive enzymes: alpha amylase and lipase. By inhibiting these enzymes, Ascophyllum nodosum extract may limit the amount of fats and carbohydrates absorbed and stored by the body. In overweight individuals eating a high calorie diet, Fat & Carb Blocker may therefore promote weight loss. The daily dose recommended for effective slimming is one capsule of Fat & Carb Blocker with each of your two main meals. Fat & Carb Blocker can be combined with Metadrine and Appetite Control Formula, in order to capitalise on several complementary metabolic pathways. Adults. Take one capsule with the two main meals of the day. Each capsule contains 200 mg of ID-alG™.